Rue hung on to her old and expired union membership cards, thus we are able to offer you this gem – Rue McClanahan’s signed, Actors’ Equity union card. It is in great condition, and we’ll include a print of the picture posted – with Rue looking very much the professional actor – and a Certificate of Authenticity from Estate of Rue. Rue usually kept these flat fossils on her coffee table and used them as coasters. We don’t think they actually ARE coasters – we think they are rare, highly collectible FOSSILS! However, that is what Rue used them for; and we could be mistaken, maybe someone out there is selling fossils as sets of coasters(!). Certainly there are pictures in Rue’s archive that show these pieces on Rue’s coffee table – and probably with Rue in the shot, too – so we’ll look around and post any photos we can find later. 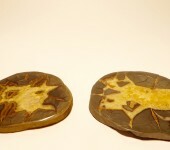 Rue’s pair of fossil “coasters” measure about 4″ across each, and they will appear together on the same Certificate of Authenticity from Estate of Rue. *UPDATE – I found a photograph of Me and Rue gabbing in the living room and you can see both of these “coasters” on the coffee table. One is clearly showing and she has her water glass on the other. This brass and enamel cuff has hearts painted on it and so it made the cut for Valentine’s Day. There is a small chip in the red enamel where Rue took a dive late one night – we’re not talking – but otherwise it is in solid shape. It measures 2.5″ across, but since it is a cuff you can open or close it as you wish. It is almost 2″ high at it’s center point and weighs 1.8 ounces. Comes with a Certificate of Authenticity from Estate of Rue. Although we don’t think this is made of any “precious metal,” it is still precious because Rue owned and wore it on her tiny ankle. The chain is 9″ long and the little heart is about .25″ across. Comes with a Certificate of Authenticity from Estate of Rue. 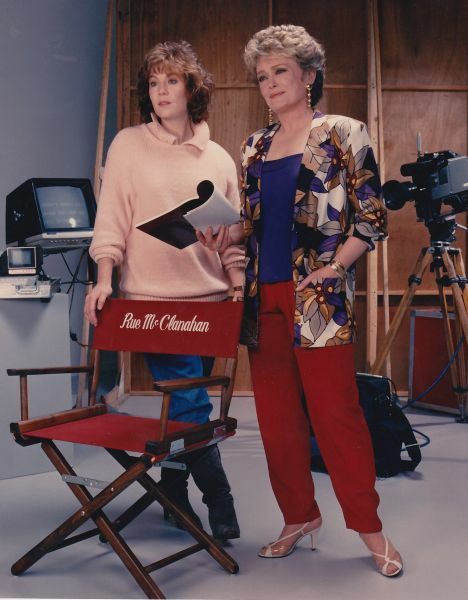 Rue McClanahan was a VERY politically active person. Boy oh boy would she have a lot to say about this election coming up! Rue did her homework and read a lot. She particularly enjoyed biographies and autobiographies about and by political figures. 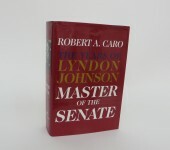 Here is one of the hardbound FIRST EDITION books from her collection. The volume comes with a Certificate of Authenticity from Estate of Rue. Part of Rue’s job involved showing up at big network events, so she hit the red carpet for the CBS 75th Birthday Celebration held in New York City in the early 2000s. 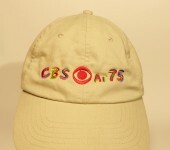 One of the gifts presented to the celebrities that attended was this special piece of memorabilia – a hat designed by the world-famous artist Peter Max. Rue’s Peter Max hat comes with prints of the photos posted – Rue with Peter Max in his studio, and one of her on the red carpet from the night of the party – and a Certificate of Authenticity from Estate of Rue. Here is one of those wonderful little souvenir cards that many restaurants used to offer, but are very rare these days. The “World Famous Turkish Kitchen” shot a Polaroid of Rue and her then sixth husband when they came in for dinner one night. Rue looks fabulous in the photo, and we think she is wearing an outfit from “The Golden Girls!” The Polaroid measures 3.5″ x 4.25″ and the whole card is 4.5″ x 6.25″. 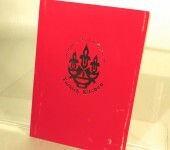 Rue’s “Turkish Kitchen” memento comes with a Certificate of Authenticity from Estate of Rue.